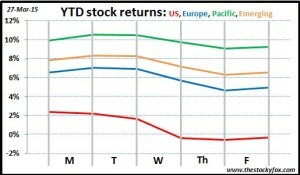 It was a down week for markets across the board, with the US taking the worst of it, falling almost 3%. 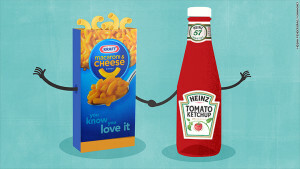 The week started off with news of Senator Ted Cruz declaring his candidacy for US president and then Heinz and Kraft merging. But sadly, the rest of the week’s news was dominated by the airline crash in France and the revelations of its cause. Senator Cruz became the first politician to throw his Texas-sized five-gallon hat into the ring. I don’t think this is specifically big news in that it’s not likely that Cruz would get the Republican nomination, much less get elected to the nation’s highest office. But it does kick off the race that will be run over the next 20 months. Obviously the stakes are enormous for the US and the world. From an investing perspective, they are equally huge. US government spending dwarfs that of any other company (or probably the top 50 largest companies combined), so decisions made there will certainly move markets, creating business winners and losers. Appealing Obamacare would have a huge impact on the healthcare industry, expanded military spending would drive the defense industry, and another hundred examples of how the decisions made by the occupant of the White House will affect the stock market. Nothing to see here now, but we’ll be watching these developments closely. Two iconic American food brands are merging. In general merger and acquisition (M&A) activity is seen as a sign of a healthy economy. When the announcement was made on Wednesday, Kraft’s stock shot up 40% which represents about $15 billion in additional value. That’s a good thing, right? It means that the investors (who are in the business to make money) think there’s at least $15 billion in value at Kraft than is being realized today. It might come from synergies between the brands, from trimming waste, or a host of other initiatives. But the fact is that in this economy there is a ton of value still to be uncovered in companies, and there are enterprising investor groups who are ready to untap it, and they’re putting their money where their mouth is. This tragedy was the biggest story of the week. When the crash happened on Tuesday, it seemed a crash that was caused by mechanical problems or pilot error or inclement weather. None of that makes the crash any less tragic, especially to the 150 people who lost their lives, but I think we as a society can accept those “accidents” happen every once in a while. Statistically, air travel is an incredibly safe form of transportation, and I think we as a society accept that there are certain risks that we largely understand and accept. Of course, the bombshell came on Thursday when investigators concluded that the plane was deliberately crashed by the co-pilot. This is what really shook the public’s faith, and battered the airline stocks (which were down about 5% during a week where the market was down about 2%). As the CEO of the airline said, “in our mind [a pilot deliberately crashing the plane] was simply impossible.” This was something no one was expecting and it’s proved very unnerving. We accept there is a very small risk of airline accidents happening; we do everything we reasonably can to minimize that risk and then we accept that. Even terrorist attacks we accept; we do everything we can to minimize it but then accept the microscopic risk that remains and we go about our day. But no one was really considering having to worry about the pilots. It’ll be interesting to see how the industry reacts, but the preliminary reaction of the stock market says this will be tough. There are news reports that the pilot showed signs of depression years before when going through training—who hasn’t been depressed at some point in the past ten years? Airlines are a notoriously fragile industry that has tremendous booms and busts. All the while, a healthy and profitable airline industry is crucial to our world economy, touching pretty much every industry. I am sure the airlines will find a solution, but I fear it might be a costly one that requires more screening of pilots and more bureaucratic licensing programs that will just add costs. We’ll see. Have a great weekend. I won’t do a movie or book review tomorrow (still recovering from all the investing tournament posts), but I’ll be back to my regular cadence starting Monday, where you’ll see a post on whether to invest in stocks or mutual funds.